Ground water is water below the land surface that fills the spaces between grains of sediment and rocks, or fills cracks and fractures in the rock. Saturated zones in sediment such as sand and gravel, and in fractured rock formations, that receive, store, and transmit water to wells are called aquifers. Clean and plentiful ground water is a vital resource for personal and economic health everywhere in the United States. Each day, over 130 million Americans get their drinking water from ground water. About 40 million are supplied from individual home wells. Ground water is a safe, economic and environmentally friendly resource. We don't need to dam up rivers and disturb ecology to store water. Mother Nature has made the rocks of the earth as a natural storage place for ground water. We can all play a role in protecting America's ground water. Private well owners have a special responsibility to ensure the safety of their drinking water. Water in aquifers comes from rain and melted snow that filters through the soil. As the water moves down, plants consume a portion, some is evaporated, and some is retained by the soil. The rest seeps downwards, usually very slowly, to add water to the aquifer. This process is part of the hydrolic cycle. The amount and quality of ground water varies from place to place both within individual states and from state to state, because geology, climate, and land use are different. Natural factors, such as the type of rock, gravel, sand or soil. Or by pollution, for example, from poorly managed agriculture, inferior septic systems or community waste disposal sites. Public education about contamination, and community involvement in protecting aquifers, can help ensure safe drinking water throughout the United States. How do we get Ground Water? In most cases, a water well is needed to reach the aquifer where ground water is found. Today, most wells are made by drilling into the rock layers using drilling machines (rigs) to access water deep beneath the surface. In most cases electric pumps are used to raise the water to the surface. The creation of a water well consists of several elements. After selecting the site to drill the well, the process usually included drilling, development, testing and equipment installation. A water well is a specially engineered hole in the ground. It should be located and constructed in a manner which meets all the codes and guidelines. Proper construction and location is of most importance, to help ensure safe drinking water. Your County health officers, local code enforcers and ground water contractors can give you advice on proper well location and construction. If you plan wisely, a good, dependable water well can supply you with all the water you need now and in the future. A rule of thumb is to allow for between 75 and 150 gallons per person per day. You need to take into account the peak demand, for example, when there may be extra guests. The amount of water expected for domestic supply is usually 4-10 gallons per minute. However, with an adequate storage tank, a well producing as little as one gallon per minute can be sufficient for domestic needs. 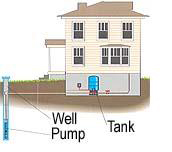 In many wells, several hundred gallons of water are already stored in the well column. For every foot of a 6 inch diameter well below the water level, there are about 1 1/2 gallons of water. Outside use of water can pose much greater demands. You need to calculate the required well yield if your well is needed for additional water uses such as: swimming pool, lawn and garden irrigation, fire protection, etc. Studies show that most Americans would prefer their own private water well. You can decide how to treat your well water if you so desire. You may not ever have to worry about water restrictions. After the initial cost of installing a well and pump system, your water is virtually free. Even with budgeting for future service, it will more than likely be less expensive than pipe line water.